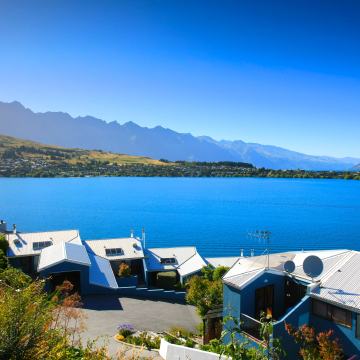 Spinnaker Bay Queenstown Apartments has 18 comfortable and superbly appointed holiday rental apartments. Chose between 1, 2 and 3 bedroom fully serviced units all with incredible lake views. Every apartment comes fully equipped with almost every convenience you’d want at home. Generous bedrooms and living areas make relaxation on your holiday in Queenstown very easy. We really mean it when we say EACH apartment has magnificent views of the lake and mountains- and there is even a view from the indoor pool as well! Are you looking for affordable and comfortable ski accommodation in Queenstown? Spinnaker Bay Apartments is your ideal place to stay. Each bedroom is set up with a split capable Super King sized bed giving flexibility to bedding requirements i.e. either a Super King bed or 2 single beds in each bedroom. 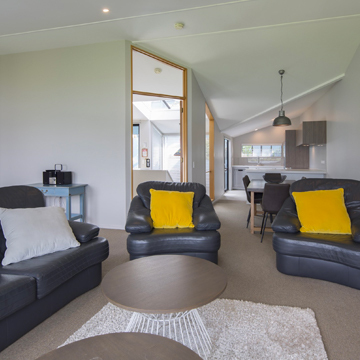 The fully equipped self catering kitchen gives you a very affordable accommodation option in Queenstown while the many cafès, restaurants, bars of Queenstown are only a short stroll away for your après ski. Soak in the pool or soothe your tired limbs in a steamy sauna after your long day at any one of the six nearby ski fields. Our heated driveway provides safe winter access in times of snow or frost. You can relax in the peaceful surroundings of Spinnaker Bay Apartments all year round. Enjoy all the activities Queenstown has to offer and come back to your apartment just 20 - 25 minutes walk from the town centre. Taking in the amazing views from the private balconies, or spending time in the secluded courtyard and making use of the BBQ are some of the special features Spinnaker Bay Apartments offer. Adults and children enjoy the heated indoor 12 metre swimming pool.